Yemen – Holding Hodeidah Is The Houthi’s Last Chance – Stop the Wars at Home and Abroad! The UAE and its mercenaries have renewed a large attack on Hodeidah. Should they capture it they will control all supplies to the Houthi areas. The Saudis and the UAE seem to use the 30 days Trump has given them for maximum gain. 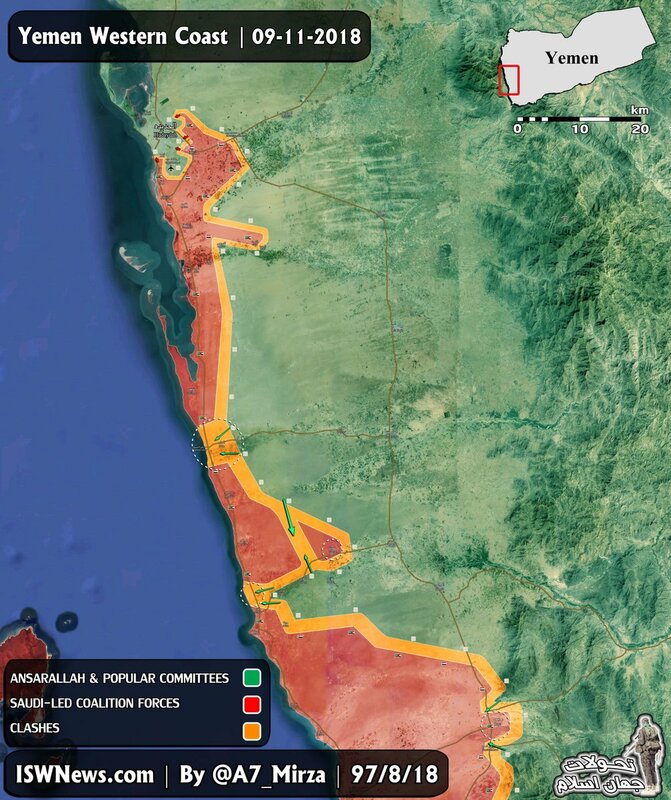 The attack led by the United Arab Emirates has nearly achieved to surround Hodeidah. The city and its port are the only way left to provide food to some 20 million people living in the capital Sanaa and the northern highlands. Should Hodeidah fall, the Houthi and their allies will have to submit to the Saudis or see their people die of starvation. Currently the Houthi try the same tactic that broke earlier UAE attempts to conquer Hodeidah (upper left). They cut the long UAE supply line coming from the south along the western coast over which the attacking force (red) is provided with food, fuel and ammunition. If the latest news is correct they achieved that in two places. biggerIt is relatively easy to interrupt the logistic line for a few hours. It is far more difficult to hold the blocking positions. The landscape along the coast is flat and the UAE proxy forces have tanks, artillery and air support, all of which the Houthi lack. They are mountain infantry fighters and have no means to defend themselves on flat land. They will have to resort to constant surprise attacks in different locations along the supply line to keep the UAE forces off balance. They are somewhat successful (pics) with that. It is not known if they have the manpower and ammunition reserves to maintain such attacks for long. From the very beginning of the Saudi/UAE war on Yemen the Saudi strategy was designed to starve the highlands into subjugation. Their air attacks were concentrated on water supplies, farms, agricultural factories, fishery and transport routes. They blocked smuggling routes and hindered humanitarian supplies. They took control of Yemen’s central bank and willfully induced hyperinflation. The Survival Minimum Expenditure Basket (SMEB), accounting for food, water, hygiene and cooking fuel needs was revised to YER 73,000 (USD 104) per month last week, reflecting increased costs of more than 40% since July this year. Inflation on the price of essential items, combined with the rapid depreciation of the Yemeni riyal and lack of access to income are among the key factors driving Yemen’s worsening hunger crisis. The blockade of the port city is meant to bring the Yemeni people to their knees. The coalition is using famine and cholera as weapons of war. It is also extorting the United Nations by threatening to cut their funds, as if it were a charity and not a responsibility required under international law and Security Council resolutions.The United States wants to be viewed as an honest mediator — but it is in fact participating and sometimes leading the aggression on Yemen. Yesterday the U.S. announced that it would end its refueling of the Saudi planes that bomb Yemen. This means little. The Saudis have their own tanker fleet and by now enough experience to use it. The UAE planes fly from a base in Eritrea and need no refueling. U.S. intelligence support for the Saudis and the delivery of other war supplies continue. There are also U.S. troops on the ground who might well direct the Saudi/UAE attack. “… Taking into account that Washington is offering direct military support to the coalition units fighting in Yemen, the sincerity of the United States’ statements in favor of the soonest end of the active phase of the Yemeni conflict is called to question,” the ministry said.”So far, everything indicates that the US side is not planning to change its policy in Yemen and the parties to the armed confrontation in that country are still staking on settling the conflict by force,” the ministry stressed. To call for a ceasefire in 30 days and to end the refueling for Saudi planes are fig-leaf moves by the U.S. to distant itself from the willfully caused famine of millions of Yemenis. The U.S. has the leverage to make the Saudis and the UAE stop their attack on Hodeidah. Early October President Trump said himself that the Saudi rulers would not last two weeks without U.S. support. That wasn’t an exaggeration. If the Trump administration really wanted, the war on Yemen would stop tomorrow. Instead it considers naming the Houthi a terrorist organization. That step would be a major escalation that would make any peace talks much more difficult. 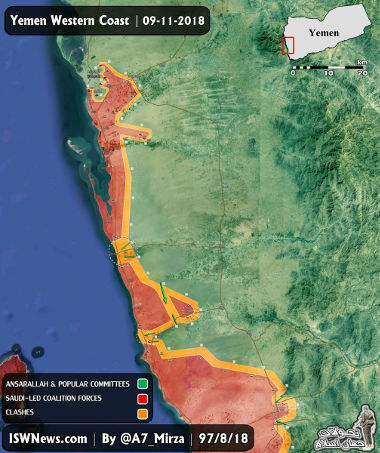 The Houthi attacks on the supply line of the attacking forces along the west coast are the last chance to prevent the fall of Hodeidah port, and the imminent famine of millions of people. Moon of Alabama is a popular blog by an interesting political analyst who goes by the name Bernhard.